Zero BS CRM lets you manage Companies as well as Contacts, which is perfect if you're in a B2B market or you need to manage vendors/other organisations. Manage unlimited companies/organisations and unlimited contacts with ZBS! Get a high-level CRM for B2B Sales at a fraction of the nonsense/cost of other platforms! If you're selling to other companies or organisations, you need a decent B2B CRM, there's no doubt. Zero BS CRM has internationalisation at its core, and with it's no-nonsense approach it can easily scale with you, without the pain of ever-increasing service costs. Zero BS CRM runs on Contacts and Companies, they're the backbone of all CRM activities. They're literally the C in CRM, and we prioritise them as such. 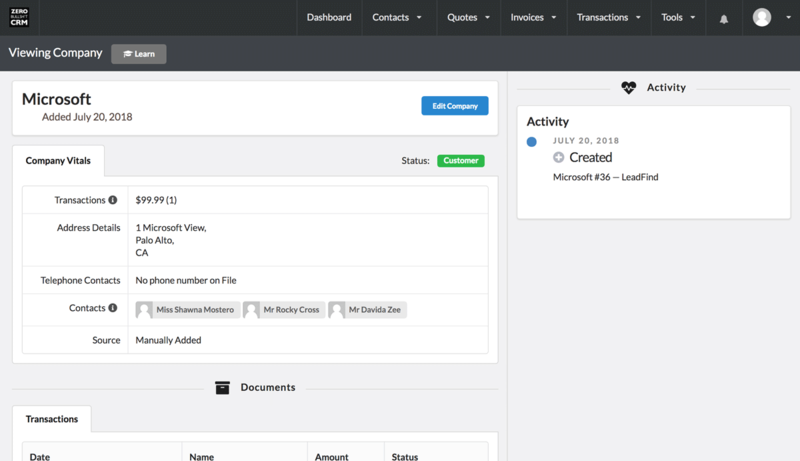 Once B2B Mode is enabled you can manage Companies in much the same way you manage Contacts. Addresses, Telephone numbers, Emails etc.